The British gold sovereign is one of the most ‘collected’ gold coins in Ireland today. We used it when we were part of the UK and it would seem that we are still hoarding them. Named after the English gold sovereign, previously last minted in 1604, the name was revived with the Great Re-coinage of King George III in 1816 and minting began in 1817. Sovereigns were produced in large quantities every year until World War I, when the UK came off the gold standard. From then until 1932, sovereigns were produced only at branch mints at Melbourne, Sydney, Perth, Bombay, Ottawa, and Pretoria. The exception to this was in 1925 when, some were produced in London, as part of Winston Churchill’s ill-fated attempt to return the UK to the gold standard. The last regular issue was in 1932 at the Pretoria mint. During the years 1949 to 1952 sovereigns dated 1925 were produced for the international bullion markets although these can be differentiated by a more pronounced rim. The coinage of George IV’s reign reveals a vain (old) king – which he was – who liked to be portrayed as young, handsome and slim, in sharp contrast to the images created by contemporary cartoonists who painted him as gluttonous and overweight. George IV gold sovereigns are, generally, quite scarce nowadays. His reign was short and there are only 10 dates to collect (11 if you want both of the 1825 types). 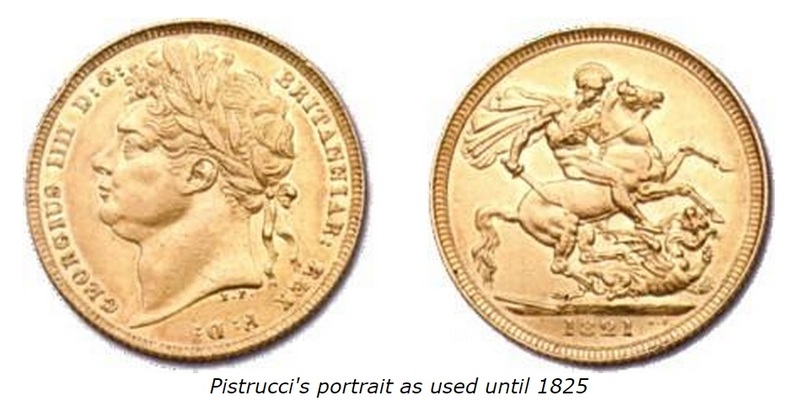 In general, his coins are scarcer than those of Victoria and are quite highly sought after. George IV’s gold coins sell at a substantial premium over bullion values. The Trial of the Pyx is the procedure in the United Kingdom for ensuring that newly minted coins conform to required standards. Trials have been held from the twelfth century to the present day, normally once per calendar year; the form of the ceremony has been essentially the same since 1282 AD. They are trials in the full judicial sense, presided over by a judge with an expert jury of assayers. Trials are now held at the Hall of the Worshipful Company of Goldsmiths. Formerly, they took place at the Palace of Westminster. Coins to be tested are drawn from the regular production of the Royal Mint. The Deputy Master of the Mint must, throughout the year, randomly select several thousand sample coins and place them aside for the Trial. These must be in a certain fixed proportion to the number of coins produced. The jury is composed of at least six assayers from the Worshipful Company of Goldsmiths. They have two months to test the provided coins, and decide whether they have been properly minted. Criteria are given for diameter, chemical composition and weight for each class of coinage. 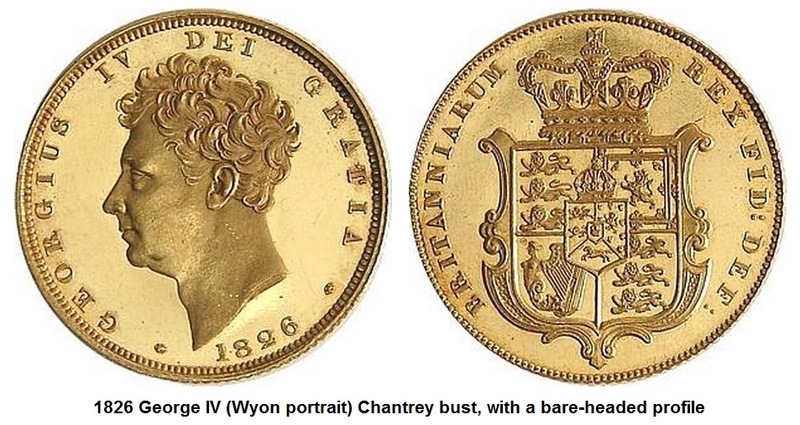 George IV sovereigns are unusual insofar as there are two different portraits for the year 1825 – the first follows in the classical (Roman) style of the ‘laurel head’ and features ‘St George & the Dragon’ on the reverse. The second design features a ‘bare head’ design by William Wyon, with a coat of arms (shield) on the reverse designed by Jean Baptiste Merlen. This reflects the Act of Monetary Union between Great Britain & Ireland in 1825. In effect, the coinage in both countries changed, so a design change was needed.